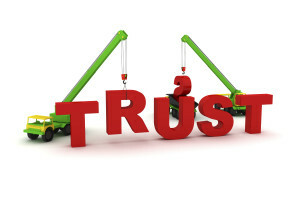 Trust is an elusive characteristic that builds over time and experience. It is difficult to develop and easy to lose. Woody Allen said, “90% of life is showing up.” If that’s true, then the remaining 10% is doing what you say you will do. Almost all trust is conditional and situational. I trust an individual or a company based upon my personal experience or the recommendation of others. Situationally, in small things, trust is easily given. I trust that the gasoline I pump into my vehicle will work to power my car. Over time it always has. I expect this time it will also. However, in other more important areas, I find trust elusive. When I have a lot to lose, I am less trustful. Or when the negative reputation of an individual or company has preceded my interactions with them, I become very guarded. A friend once jokingly told me, “The secret to a happy marriage is low expectations.” The irony in this joke is that you don’t enter into marriage because you have low expectations. This is similar to the agreement one enters into when they successfully land a new job. The new employee brings all kinds of expectations, most of which are never articulated. The employer also has all kinds of expectations, the most important of which are never articulated. In addition to hiring for functional skills, employers look for attitude. Employers are not really sure what kind of attitude works best for the position, but they’ll know it when they see it. It’s the company’s culture that matters most. Trust in American companies is at an all-time low. It is a failure of leadership. Trust is more than an esoteric virtue. It is the foundation of human interaction and the foundation of commerce. I trust the value represented by a dollar bill is worth a dollar. Over the last two hundred years, capitalism has raised the societal standard of living for more individuals faster than any system in the history of humanity. Two hundred years ago, our life expectancy was less than thirty years. Most people lived on subsistence farming and rarely finished the eight grade — if they went to school at all. Yes, we’ve come a long way. And there is so much more to do.